Lawmakers started the legislative session talking about changes they would like to make in the state's ethics laws. Now — and it is not the first time — they're sending some of the most delicate items back for more study. The Texas Legislature’s regular session still has more than five weeks to go, so it is too early to write an obituary for any bill. That said, it is clear that some ideas just aren’t moving, like regulation of and disclosures by candidates, lawmakers and lobbyists. Some measures starve for lack of attention, as when lawmakers decide not to even give them a hearing. Some get a hearing but never get a vote in committee. Committees kill some bills, and the ones that get out of there have to get past the lieutenant governor in the Senate, or the House’s perilous Calendars Committee, to get to the floor for debate. If it passes in one chamber, a bill has to go to the other side of the Capitol and do it all over again. The governor has an opportunity to veto. The cliché is true: The process is designed to kill bills, not to make new laws. Most legislation just disappears. Big or persistent issues come back every two years, and the general theory seems to be that anything really important to voters will get another chance, eventually. Several ethics proposals appear destined for legislatively induced comas. They won’t completely die, but they won’t become law, either. Lawmakers are setting them aside in a nice bundle that will be studied after the session is over. One proposal, for instance, is to update the financial categories on the personal financial disclosures required of officeholders. They were set a long time ago, when $25,000 was a more unusual number than it is now. That’s the top value lawmakers report on assets; for instance, an officeholder with $500,000 in a company’s stock simply reports ownership of more than $25,000 worth. The numbers worked better in the 1970s. A proposal to put those reports online appears destined for study hall, too, although lawmakers might require electronically filed reports for the first time, without necessarily making them available online. Creating an investigative division at the Texas Ethics Commission is also on ice. That “interim study” is a pat on the head for anyone who wants legislators to tighten the rules, or to enforce the ones now in place. It allows lawmakers to set an issue aside without openly voting against it. 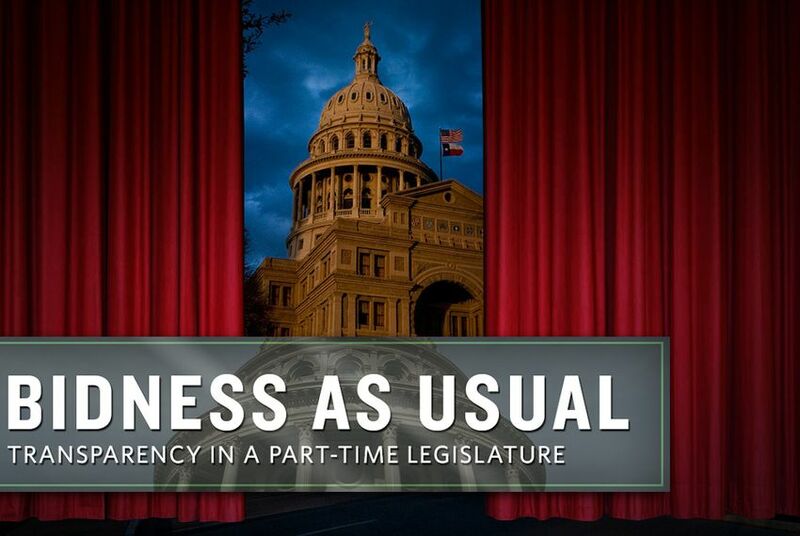 In the meantime, they’re working on a periodic tuneup of the Texas Ethics Commission — a perfect legislative vehicle for changing other ethics laws. For instance, one provision would perform triage on complaints to the commission, separating picky and administrative issues from serious violations, and allowing the commission’s staff to resolve some issues without going to the full panel. That’s important; the commission is regularly bogged down by the little stuff. Some big ideas are dying, however, and lawmakers are wiping away the fingerprints. Who wants to vote against an ethics proposal? Better to defuse the situation, relegating it to the time between legislative sessions for study. If voters really want change, the issue will float back to the surface sometime in the future. The Ethics Commission bill actually resulted from an interim study. The Sunset Advisory Commission periodically looks at agencies up for legislative review, and it considered but did not recommend many of the issues lawmakers plan to study, again, when this legislative session is over. The interim study would be due in December 2014, on the eve of the next regular legislative session and after another election cycle held under the current rules and regulations. The interim study dodge — and its relative, the “pilot program” — is not confined to ethics legislation. It is, however, a predictable outcome. Tom Smith, better known as Smitty, lobbies for the consumer advocacy group Public Citizen in Texas and has been in the middle of ethics debates for decades. Over the years, he generally has argued for more disclosure, easier access to the disclosures that are made, and better enforcement of serious infractions by candidates and by people in office. It is difficult to change ethics law. It often happens only in the midst of scandals that periodically force legislators to clean up their business. And when it doesn’t happen, it fails in a familiar way. Smitty went to the records, and counted eight studies on ethics over the last 25 years. Lawmakers are about to start number nine.